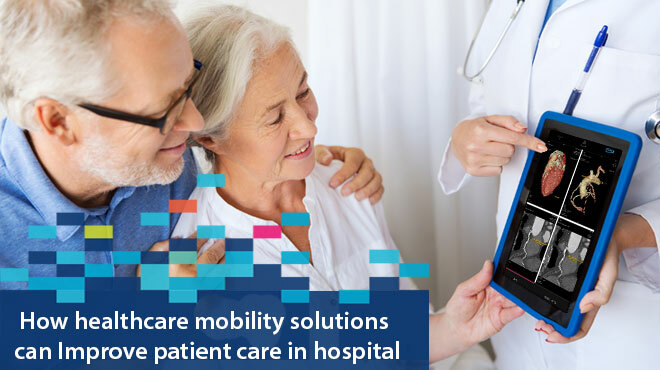 How Healthcare Mobility Solutions can Improve Patient Care in Hospital? technology How Healthcare Mobility Solutions can Improve Patient Care in Hospital? Digitalization has not just made hospitals smart, but also improved patient care to a large extent. Understanding the medical terms and operation procedure was tough even for educated people a few years back. But the same scenario has no longer been there. People can get everything at their fingertips. Today the healthcare industry is a digital-driven ecosystem. But that is not just focused on transforming hospital infrastructure or facilities, but also to enhance patient experience. Today the dynamic growth of mobility solutions is changing the face of the healthcare industry, and it is optimizing an every asset that a hospital can have. The global market research and consulting organization Market Research Engine predicts that the healthcare mobility solutions market will grow at a CAGR of 28.0% by 2023. So we can expect mHealth apps that are engineered adhering to HIPAA (Health Insurance Portability and Accountability Act) regulations to grow in number. In fact, mobile apps are already optimizing the patient experience, in the form of blood bank apps, appointment booking apps and more. When mentioning blood bank apps here, the blood bank app called iRelief developed by FuGenX Technologies triggered my mind (india.com/technology/irelief-an-app-just-like-uber-to-help-you-call-ambulance-blood-banks-and-health-care-instantly-1630179/). The app helps people find blood of their requirement at any place in Bangalore and other cities in India in a few taps. The app also helps find ambulances and avail home care services. Let’s see how mobile apps help improve patient care. As we all know, computer software has already replaced paper documents on patient records. But that doesn’t offer the convenience of anywhere, anytime accessibility. But mobile apps enable that. The complete health records of a patient that includes X-ray, prescriptions, medical history, previous consultations and discharge notes can be stored in a central environment in a server, so anybody who is related to that data can access it from anywhere he is, inside or outside the hospital through a mobile app. So they can give their inputs as quickly as possible on the move during emergency or any other circumstances. Quick access to the patient’s clinical data is requisite for emergency consultations. Mobile app offers this convenience. Even physicians can make changes to the patient’s clinical data every time they treat patient, so that the patient’s health data always remains updated. BMJ Quality & Safety study says electronic health records in the place of paper health records have decreased the death rates by 15 percent. Yes, it has been absolutely possible. Health diagnosis apps that are synchronized with smartwatches, smart bands or similar products enable the measurement of blood pressure, heart rate, glucose level, visual activity and more in quick time. Manhattan’s research says electronic resources are playing a huge role in reducing the clinical decision-making time, in fact it is more than 50%, and reducing costs incurred to treatment and eliminating unnecessary procedures. Medical calculator apps that replace traditional medical calculator’s help physicians know about risk score upon the input provided (patient’s current health condition). In fact, these are very inexpensive and less time-consuming equipment and prove to be error-free equipment. Getting reliable and accurate results to create a fast-paced clinical environment is extremely easier with these type of equipment. As a result, there is an increased demand for app development companies who develop medical calculator apps. Hospitals can save more lives and optimize clinical decision-making capability with handy diagnosis. Hospital is an integrated environment, where multiple departments like inpatient wards, clinics, outpatient services, labs, intensive care units, and operation theatre require to be synchronized in the form of data transfer between them. Mobile app offers this convenience. An efficient mobile application that allows staff including doctors, pathologists and front office executives connect each other through text, email or video call simplify and speed up the treatment. For instance, a report that is just generated in the lab can be directly sent to the mobile of physician who is in the operation theatre, without requiring a person to physically bring the reports from the labs. Nurses in the inpatient ward can immediately reach doctors with the reports through mobile in case of emergency, so no time gets wasted and better medical decisions can be taken in a short time span. Apps that enable video conferencing on the matters like quick consultation, diagnosis and prescription improve productivity. Mobile apps are no longer an entertainment piece. So if you are a forward-thinking business, mobile presence would be crucial for your success. If you’re a looking to develop your own app, it is better to contact with an expert mobile app developers, so you can achieve the intended result.